What began as a summer internship project designed for an undergraduate student evolved into a one-year study of one of the deadliest, but little known viruses. Researchers at The Scripps Research Institute (TSRI) have now solved the structure of a key protein in the Nipah virus, which could pave the way for the development of a much-needed antiviral drug. The Nipah virus is an emerging pathogen found in Southeast Asia, particularly Malaysia, Bangladesh and India. The first outbreak was in 1997, followed by yearly outbreaks since then, with increasing mortality rates. Carried by the flying fruit bat, the virus causes only mild illness in pigs, dogs, cats, horses, goats and sheep, which also spread the disease. But in humans, lethality has ranged from an initial 40 percent to 70 and, in some cases, even 100 percent. There are no therapeutics for the virus and no vaccines for humans. “It’s the scariest virus you’ve never heard of,” said Jessica Bruhn, a graduate student in TSRI Professor Erica Ollmann Saphire’s lab, noting that the movie Contagion, a medical thriller that came out in 2011, is based on outbreaks of the Nipah virus. Bruhn, first author of the new study, which was published recently online ahead of print by the Journal of Virology, initially designed this study as a summer project in 2012 for Katherine Barnett, then an undergraduate student in the SINAPSE program and also a co-author of the paper. Bruhn and Barnett helped launch the work cloning the genes and working on the data. Barnett left to attend graduate school at Harvard University and Bruhn and colleagues continued working on the project, focusing on the P protein, a key component of the viral replication complex, which is essential for the virus to replicate its RNA. “If you can prevent the virus from making more RNA, then it can’t replicate, which is a good strategy for developing antiviral medications,” Bruhn said. In X-ray crystallography, scientists manipulate a protein or some other molecule so that a crystal forms. This crystal is then placed in a beam of X-rays, which diffract when they strike the atoms in the crystal. Based on the pattern of diffraction, scientists can usually reconstruct the shape of the original molecule—but in this project, the challenge was interpreting the data. Luckily, Bruhn attended a crystallography workshop in Chicago at the Argonne National Laboratory and there she met experts in the field and learned new techniques, such as ab-initio modeling, which leverages computational structure prediction. The team used a software pipeline called AMPLE developed by the Rutherford Appleton Lab and the University of Liverpool to generate models and finally determine the structure. 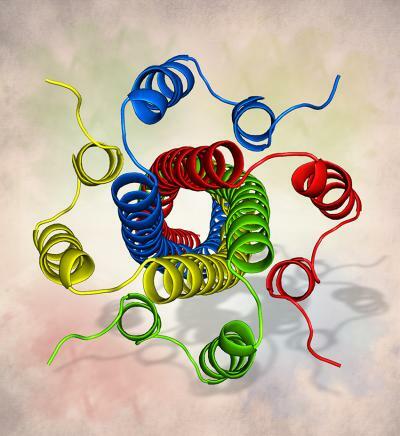 When the scientists solved the crystal structure of the P protein, they found that it forms a tetramer, with four proteins that join to form a single unit. She said this speaks to the importance of structural conservation over sequence conservation – meaning that regardless of whether a protein has an identical sequence of amino acids or not, the structure could still be similar, especially when that structure has the important function of replicating the virus’s RNA genome. The team is continuing to work on understanding the virus and why it is so deadly. Since the virus is a biosafety level 4 pathogen, TSRI researchers can only look at parts of it but not the entire virus, so the scientists are collaborating with the Centers for Disease Control and Prevention to look at the role of this structure in infection. The scientists will also look into resolving discrepancies with lower-resolution data published by a group of French researchers positing the structure was a trimer, with three proteins. In addition to Bruhn and Saphire, other authors of the study “Crystal structure of the Nipah virus phosphoprotein tetramerization domain” include Katherine Barnett and Zachary Bornholdt of TSRI, Jaclyn Bibby, Jens Thomas and Daniel Rigden of the University of Liverpool and Ronan Keegan of STFC Rutherford Appleton Laboratory.